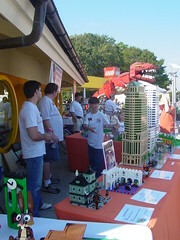 Joe Meno dropped in Wednesday night for this weekend’s LEGO display at the Festival of the Masters over at Downtown Disney. We stopped by the LIC & picked up some of the new mosaic sets… spent part of the nights Wednesday & Thursday coming up with Disney related mini-mosaics to add to our display — WARNING: the new mosaic sets are addicting; I bought my 4th set last night. I had lots of fun with this display. I was overwhelmed by the number of people that stopped by. And floored by the quality of artwork by the chalk artist up the way from us. Erika & I walked from one end to the other taking the sites in — this is the first FotM show that we’ve attended. If you’re in Florida, try to make it to the LIC store in Downtown Disney. Our group, GFLUG, has put on a LEGO display for this weekend… Come check us out. Previous story Carrier LEGO Van Kit?